Ronald Burton at work. Not much protection! GM: Traveling the country, seeing many people, bulls, broncs, and arenas sound like a fun profession. When did you decide to become a rodeo clown? 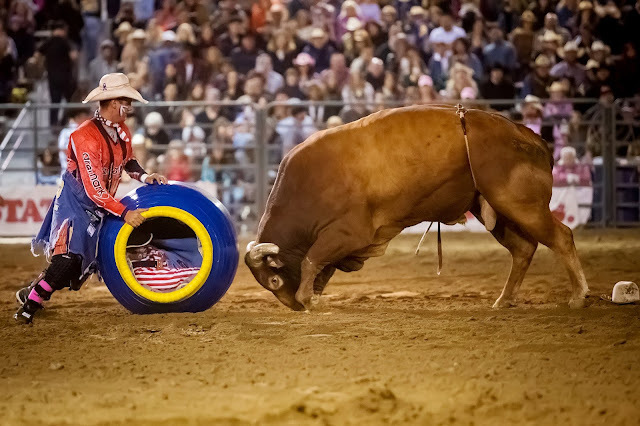 Using the barrel to help protect a bull rider in Teague, TX in 2017. GM: I don't think people realize the amount of hard work and stamina required to be a rodeo clown/performer. What do you do to stay in shape? Do you have a regular workout, special diet, or a regime to keep you agile and fit? RB: To be perfectly honest this is an area where I struggle. Diet and cardio are very important especially because of my age and all the traveling I do. Unfortunately, I have a terrible sweet tooth so my eating habits are not the best! I used to run/walk six miles every day and need to stop making excuses and get back to doing that. The diet starts...tomorrow! 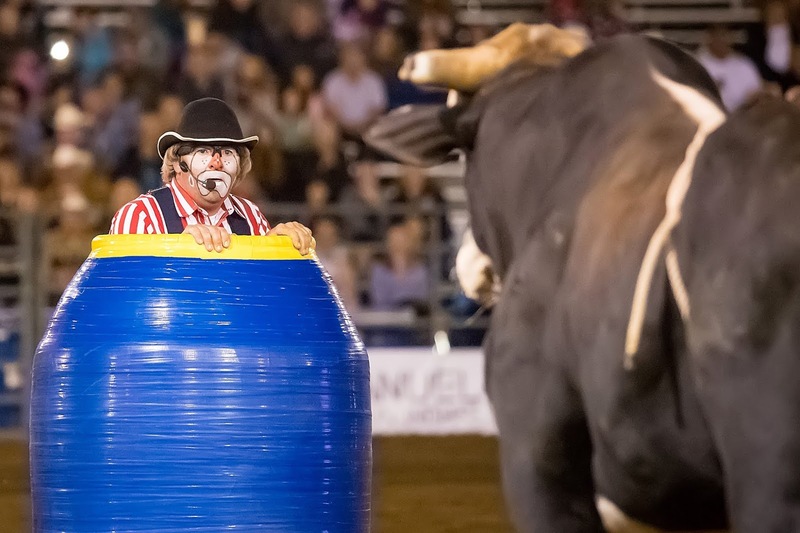 GM: As a rodeo clown, dipping in and out of barrels, your job is to protect the riders. But, Ronald, how do you protect yourself from harrowing scenarios that leave the crowd in suspense? RB: The advancements in the technology of protective equipment for bullfighters over the last 20 years is outstanding. But no matter how good the equipment is, there will always be injuries when you’re dealing with a 1200-1800 pound animal. As I said before, the outside of the clown barrel is heavily padded to protect the bull but the inside is padded too for my protection. But even with the two layers of padding, I have been literally knocked unconscious inside the barrel from a bull hitting it. Also, I'm a firm believer that pre-rodeo prayer is very important. GM: Watching the rodeo is so much fun, but it can be tough to watch when a rider gets a mean bull/bronc. You are probably familiar with the livestock and their dispositions. What bull and/or bronc stands out? RB: There have been so many throughout the years that it's hard to pick just one. I usually don't scope out the mean ones or ask too many questions but if one is mean, someone with the rodeo company/crew will give me a "heads up". If one is really mean, then I will remember him next time! (laughs) If I had to pick one recently, it would have to be a bull named "Bone Shaker" owned by the Diamond G Rodeo Company from Utah. 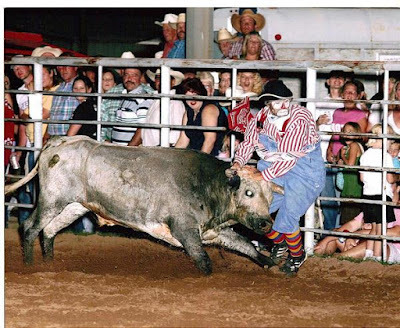 I was working the PRCA rodeo in San Bernardino, California, and had heard that he is notorious for hitting the clown barrel...and boy was that rumor correct! I usually don't sweat those mean bulls when I'm working with good bullfighters and know that I will be taken care of in the barrel. GM: How many arenas/rodeos do you attend each year? Do you have a favorite event/arena? RB: I have worked events all over this beautiful country, literally from coast to coast and even in Alaska. 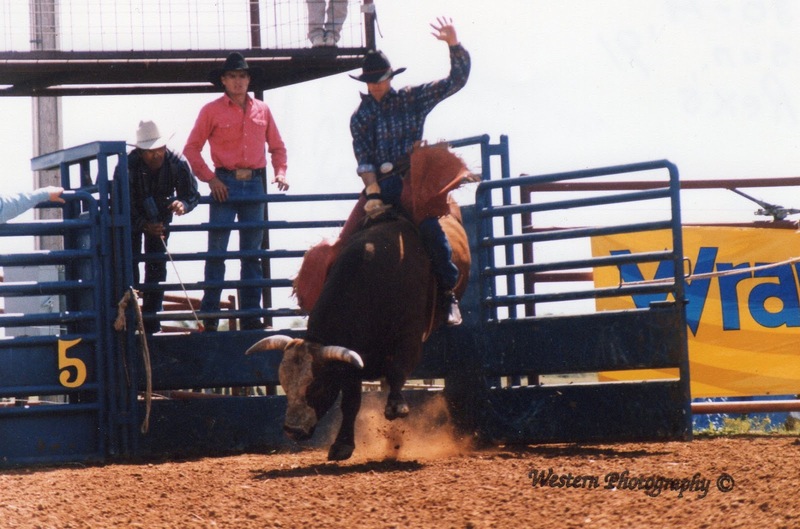 I would have to say that I'm pretty partial to the Navarro County Pro Rodeo in Corsicana, Texas, because I co-produce this event with one of my best friends, David Atkeisson. Six years ago David and I formed VLK Productions, (named for my daughter Victoria and David's daughters Lauren and Katie), and started producing the rodeo. We oversee every aspect of the event from the ground up. It was a huge step out of my "comfort zone" and has been a great learning experience and I'm proud to say that the Navarro County Pro Rodeo has become a multi award-winning rodeo in the Cowboys Professional Rodeo Association. To find out more about this great event and VLK Productions, go to www.vlkrodeoproductions.com and vlkproductions on Facebook. 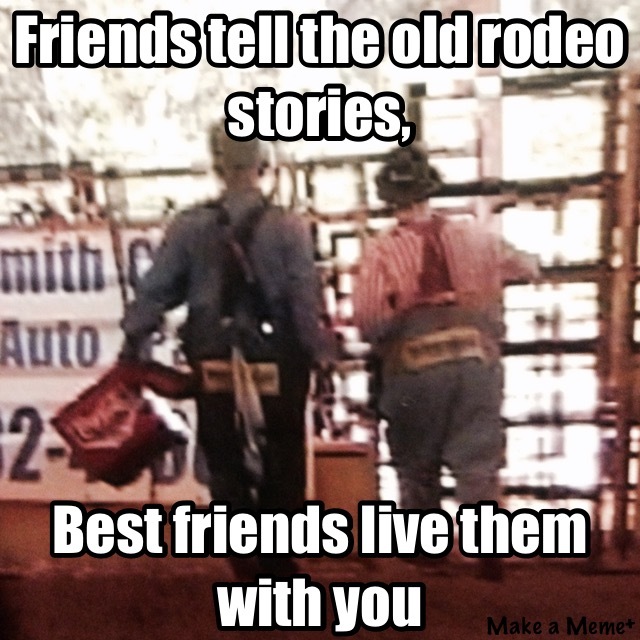 GM: With 15 years as a rodeo clown and entertainer, you must have a lot of stories to share. Can you share one of your favorite anecdotes? GM: A traveling rodeo clown/entertainer sounds like a fun job. 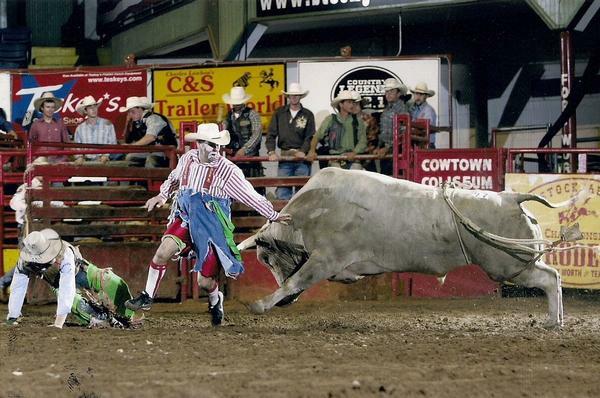 What advice do you have for those looking to begin a career as a rodeo clown? RB: The sport of rodeo is not for everyone and I don't criticize anyone for trying their hand at rodeo and deciding on another career choice because being a rodeo clown is a lot of hard work, lots of long hours, thousands of miles of traveling, lots of time away from home, and it can be very disappointing at times. But in my opinion, it's the best career in the world. So, my advice to someone starting out: Recognize and count your blessing. Be professional in and out of the arena. Have a true passion for what you are doing. Be true to who you are. Give it your 100%. Never have any regrets. Cherish the friendships you will make along the way. Always take the time to visit with the fans (especially the kids). Be a positive role model. There will be good times and there will be bad times, but the secret to it all is to NEVER let the bad overcome the good. GM: Great advice! As a rodeo fan, and speaking for other fans, we are grateful to you for protecting riders and putting on a good show! Is there anything that you would like to add about your profession and how we, as spectators, can make your job easier? RB: Rodeo fans are the best fans in the world! That's why I strive to put on a show that the whole family can enjoy. If a family is willing to spend part of their hard earned money to come to a rodeo, then I want to make sure they have the best time possible! My goal, for the 1*1/2 to 2 hours they are at the rodeo, is to take their mind off whatever struggles they might be facing and give them a huge smile and laugh to take home with them. God has blessed me way better than I deserve with a fantastic career that I hope lasts for many more years. I encourage everyone to support your local rodeos from the youth events all the way up to the professional level. 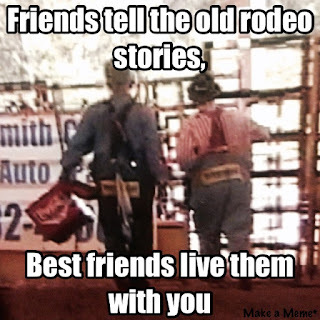 I hope the fan base for rodeo continues to grow so that our great sport is preserved for future generations to enjoy.